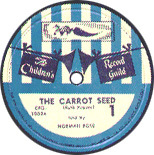 The record itself does not include a date, but David Bonner tells us that it was originally produced and issued in 1950. For reasons that are not known, the back cover of the LP (below) reveals only that the piece was "written by Ruth Krauss" and "read by Norman Rose." The 78 record (at left) also credits Krauss and no one else. Bonner, however, says that Raymond Abrashkin adapted Ruth Krauss's story for this record; Bonner guesses that Bernard Wagenaar composed the music, but he isn't sure. Though it is now out of print, the record has been reissued several times. 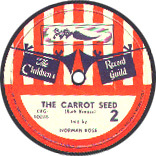 According to Bonner, a 78 of "The Carrot Seed" was released by the Children's Record Guild in 1950; a 45 was released in 1951; the LP was released in about 1960. The LP (represented below) includes an adaptation of Margaret Wise Brown's "Wait Till the Moon is Full"; and "The Eagle and the Thrush," written and told by Algernon Black. If you have any more specific information, please let me know. 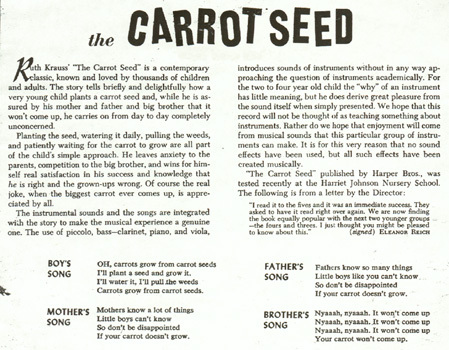 But, before emailing me with questions about the song, please read the "Carrot Seed" song FAQ, on the FAQ page. Thanks. Thanks to Molly Butler for sending a photocopy of the LP's back jacket, to Dennis Duarte for contributing scanned images of the 78's front jacket and record labels, and especially to David Bonner for providing the release dates, the names of the composer and of person who adapted the text. 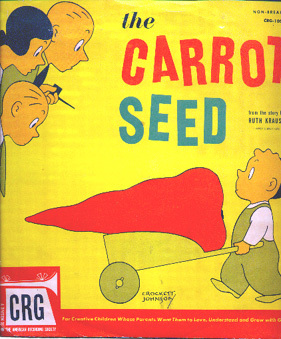 In July 2005, Kiddie Records Weekly posted an mp3 and cover art for The Carrot Seed. Check it out. You can also buy the track from Peter Muldavin's Kiddie Rekord King. Last updated Wednesday, November 21, 2007 .